As a Drummer, Mark Schulman has performed on one of the most successful tours with Cher. He has toured and recorded with Stevie Nicks, Sheryl Crow, Foreigner, Billy Idol, Cyndi Lauper, Simple Minds, the Pointer Sisters and Dave Koz. Mark’s live credits also include Al Green, Destiny’s Child, Melissa Etheridge and the O’Jays. In addition, he has contributed to the soundtracks of films, TV shows and commercials, such as Beverly Hills Cop III, Speed and The Sopranos. 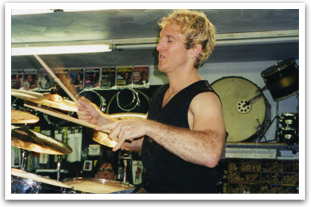 Mark is a trained audio engineer and an active educator performing drum seminars all over the world and teaching at the Los Angeles Music Academy. As a classically trained Cellist, Mark performed with the L.A. Junior Philharmonic Orchestra when he was a child. He is currently producing the music of several young artists. As a cancer survivor, Mark presents his internationally-acclaimed seminar “Make it Happen!” This inspirational and motivational program teaches children and youth how to eliminate barriers and actualize goals. He shares his unique experiences with students in middle-school, high school and colleges around the world. As a Create Now! mentor, Mark has reached hundreds of incarcerated youth and helped them to realize their dreams.